In a newly published paper, they speculate that the pattern is related to pink salmon, which return to the Salish Sea between Washington state and Canada in enormous numbers every other year—though they're not sure how. They suspect that the huge runs of pink salmon, which have boomed under conservation efforts and changes in ocean conditions in the past two decades, might interfere with the whales' ability to hunt their preferred prey, Chinook salmon. As news stories chronicled the struggles of the orcas last year—one whale carried her dead calf on her head for 17 days in an apparent effort to revive it—the four biologists looked at data on the Center for Whale Research's site. Thanks to their previous research, it took them only a few minutes to recognize a trend that had escaped the attention of other scientists. Meanwhile, Chinook populations have continued to struggle—the dearth of Chinook is considered the most severe threat to the orcas—and many scientists say they will continue to do so unless four dams on the Lower Snake River are breached. 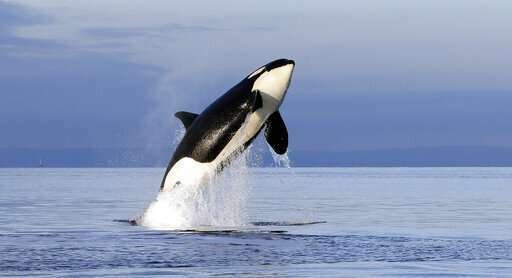 The researchers speculate that the blossoming numbers of pinks in the Salish Sea during odd-numbered years have interfered with the echolocation the orcas use to hunt increasingly sparse Chinook. The orcas almost never eat pink salmon. Because the whales are such large mammals, the theory goes, the stress caused by the pinks in odd years would not affect their mortality rates and reproductive rates until the following year—and that's why more die in even years. Another possibility is that presence of pinks means less food for the Chinook—and thus less food for the orcas, Ruggerone said. The researchers also put forth a contrary hypothesis: that the presence of pinks somehow enhances the orcas' hunting, improving their survival in odd-numbered years—though they say they have no reason to believe that's the case. Greenloon meddling causing more harm than good. No surprise.